The day after rendezvousing at Rittenhouse Square in Philly, I felt sluggish, weary, cold, and uninspired. It took me a large portion of the morning to tap into my unknown energy reserve, then heave my typewriter over to the Princeton’s farmers market. 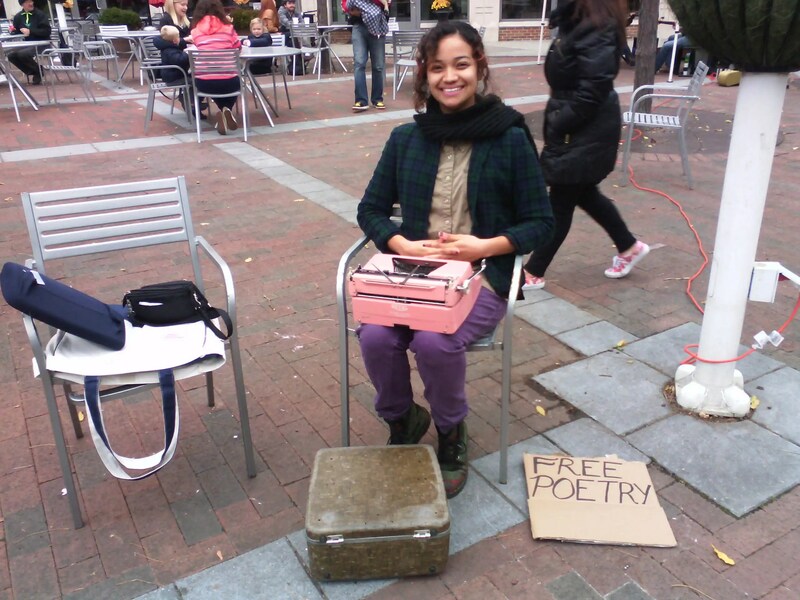 The first time I typed at the Princeton farmer’s market, I met several people. Two immediately stand out in memory. There was Mika, who I no longer consider a stranger but an amazing friend. There was also a German woman living part-time in Princeton. I’ve forgotten her name, but certainly not her grace: she gave me a beautiful bouquet of flowers after I typed her a poem. I took those flowers home as my first decorations, their fragrance and colors brightening the room I’ve been living in for the past few months. When Mona came up to me, I remember quickly registering her warmth. She has an enthusiastic calm which resonates curiosity, generosity, and a willingness to share. We talked for quite a while about a myriad of things: she was in Princeton with her husband, Donu, a mathematician who is working with IAS (the Institute for Advanced Study) until early next year. They’ll be off to Paris for a few months come January. I told her about my crazy scheme to somehow get to Paris and live/work at Shakespeare and Co., the famous bookstore. Instead of discounting my dream, she told me to look her up once I flew into town. After meeting, Mona posted the poem and photograph on her Facebook. Her friend Stef saw the post and decided to send me a thoughtful donation: “I hadn’t yet read your poem for Mona when I was made to feel happy by her post about your meeting. Particularly due to the gorgeous photo. It was your smile which did it for me.” I don’t think she knows this, but her donation came at a time when I really needed it. I was brought to tears when it slowly registered that the email wasn’t spam and that Stef was an actual living human located in Scotland who had seen a picture of me and my typewriter and thought to give something in return. Dinner at Mona’s. Photograph by Kunal. Mona invited me to her temporary but cozy home for dinner several nights ago. 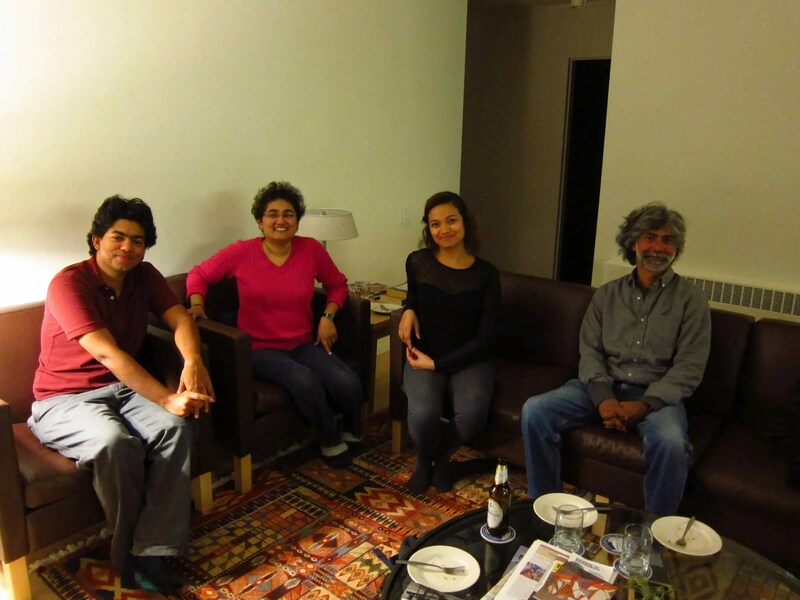 I had the pleasure of eating a delicious home-cooked meal among amazing individuals: her cousin (Aatish), her husband (Donu), and my friend Kunal (who offered to take the picture above). From love and mathematics to traveling and poetry to India and Spain to the outdoors to family and friends–I’m delighted to have had such an evening filled with inspiring conversation. I shared the story of how I fell in love with fireflies when I first arrived in Princeton; Aatish shared his incredible photos of firefly and star trails. We were both in wonder over the pleasant peculiarities of the insect, neither of us having much experience with fireflies until we came to Princeton. I learned about Aatish’s work as a teacher and science educator while we all compared thoughts over citizen science and crowdsourcing projects like Galaxy Zoo (something I had read about in the book Macrowikinomics). You can find Aatish’s blog over at Wired.com (Empirical Zeal) or follow him on Twitter (@aatishb). Fireflies and star trails. Photograph by Atishb (@aatishb). Mona, like many I’ve been fortunate to cross paths with, offered me an intangible safe-haven through her presence and spirit. I am fortunate to find I cannot even come close to recalling the number of times these types of interactions happen. I like to think of them as epiphanies in the form of fellow human beings. They can last as the briefest of blinks, or for a series of moments, or even through interrupted intervals spanning an entire lifetime. Me and my low tolerance for bewilderment. I don’t know what life is like without the compassion and generosity of others. I only know this one, the one I am in awe of. Everyday, something amazing happens–and every encounter, though seemingly mundane, is merely waiting for the chance to be set aflame. I am sitting here in the watery sunshine and reading of your mood, your need and your musings on Mona, home-cooked food and fireflies and I again feel all is well with the world, just as I did when I first saw your photo. Dearest Stef! Thanks for visiting, reading, and sharing your insightful words. I have no doubt our paths will cross one way or another. Thank you for your offer, and please drop me a line if you ever find yourself in the States. Enjoy Scotland–eventually Spain–and until then, I send you love! Hope you make it to Paris to write poetry. 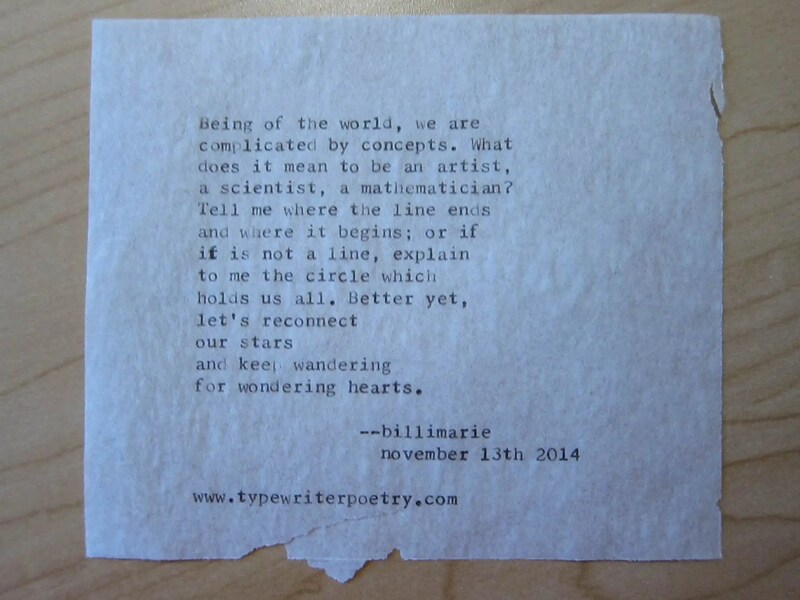 Such a beautiful post and poem, Billimarie. They sound like some brilliant people. Thanks, as usual, for reading. Intelligence and charm radiated that night; I was glad to be caught up in their stories and presence. Mona, thank you for your generous comment. Being in a new city with few friends and no support system, it’s like kindle and a flame for a hearth. You are truly an amazing woman, full of never-ending branches that spiral out and help others find their blossom. If you happen to pass through Philadelphia before you leave, don’t hesitate to drop me a line! I’ve come across some delightful shops here in West Philly I think you might appreciate. Send Donu my regards! These sound like lovely encounters. And it’s so important to meet people who flame the dreams. I hope you turn all of yours into reality. Even if there are the down days, the magic is just around the corner. They’re one of my favorite kind of connections! Recently, I’ve fallen in love with a different kind of magic–poetry’s still there, but in a less extroverted way (thankfully!). I’m curious to hear what you’ve been up to, these days.